The AFF Board has approved the introduction of a new Drug & Alcohol Policy. The policy is aimed at minimising the risk of injury or harm to the health and safety of fencers, officials and others from the use of alcohol or drugs. The policy governs the use of alcohol and other drugs, generally for recreational and social purposes. It does not cover the use of performance enhancing drugs, which are covered by the AFF Anti-Doping Policy. 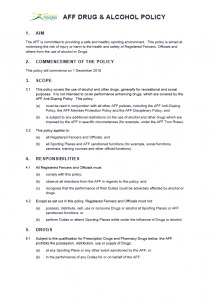 The AFF Drug & Alcohol Policy comes into effect on 1 December 2018.